Ask fellow campers about "Hitch-N-Post Campground" and nearby attractions. WOW!! This park caters to the ATV crowd which makes it noisey/dusty and the people were not very friendly unless you have a ATV. Bathrooms need work because there is mold and soap scum in showers with dirt and mold under open mats. Check before using the bathroom because several times we had no "paper". Had a problem with people not picking up after pets. Wi-Fi works only around office and owner was not too concerned about it not reaching the whole park. The club house was being used by a bunch of college students for an office/storage so it was not usable, plus they insisted on streaming, so wifi was even worse most of the time. Washing machines in laundry were not cleaning clothes. Won't stay here again. We camped at Hitch-N-Post Campground in a Motorhome. Henry's for a burger, check the little movie theater; it was being renovated by new owners while we were there. The pictures on the Internet are not an accurate representation of the park. We planned on four nights and left ASAP after the first night. Okay for a quick overnight but NOT anything longer. Sewer connection was damaged and would not stay there again. We camped at Hitch-N-Post Campground in a Fifth Wheel. Park is not well managed. Does not come close to The Trailer Life campground ratings in their book. We were given a pull through site near the road because the park was near capacity. This was of our choosing but the trees were not trimmed making it difficult to pull into the site. The water connection valve leaked terribly. This was a 30 amp site. We lost all power about one half hour after setting up. After finding the manager, I walked with her to the breaker panel to reset the breaker. I noticed the 100 amp breaker provided the power to seven sites! We have been traveling in our motorhome for 3 months of the past three years, I rarely complain about a park but this place takes the cake! By the way we were recently informed about the RV park review website and I think it is a wonderful way to share park information. Thank you! We camped at Hitch-N-Post Campground in a Motorhome. Bryce Canyon National Park, Cedar Breaks National Park, Grand Stair Case National Park, Kodachrome Basin State Park all within a few hours drive. Beautiful scenery throughout the entire area. Bryce Canyon is just 24 miles away, so convient for visiting the park. Joe's Market for fresh produce and meat. Fuel is pretty much the same price, except in the National Parks. Altitude can be an issue, CG is about 6600 elevation and the parks are much higher. Carry lots of water. 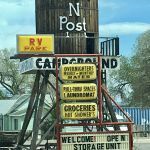 So close to Bryce Canyon National Park, Panguitch Lake & there are ATV's available for rent across the street. There is a market and a Family Dollar but because it's expensive I recommend you bring your groceries from home. Dog friendly. Restaurants, shops, a NAPA and antique store within walking range. Also 6000' elevation. This is the heart of ATV trails. The guy across the street ,his pricing was high, but there are other places to rent from ,the trails are groomed . It would be one of the things to do here. plenty of ATV and cycling activities. Although we did not explore, Panguitch is a small city with stores and restaurants, many walkable from the CG. It's convenient to Bryce and Zion NPs. Many, many places to see nearby! Office people were friendly and informative. Convenient to Bryce Canyon. We camped here after visiting Capitol Reef NP, Highway 12 is a beautiful trip. We had previously visited Bryce Canyon and Red Canyon. Don't miss Cedar Breaks National Monument. It was an unexpected suprise. Beware, not many of the shops are open on Sundays, including the only grocery store. Would recommend eating at the Tandoori Taqueria for something a little different. A nice fusion of Indian and Mexican flavors. Don't miss visiting Red Canyon while here. The trails get you up close to some fantastic red rock formations. Cedar Breaks is also a great little side trip. Scenic drive past Panquitch Lake and the National Monument Amphitheater is amazing. The park is great. When touring the park go to the very end to Bryce point and then stop at the turn offs on the way back because all of the turn offs are on the right and you don't have to cross traffic. It is a very busy place but everyone is nice and it is nice to talk to the international visitors. The Flying M Cafe is great for breakfast. Henry's has a great burger and my husband says the pork burrito is one of the best he has had. Short walk to shopping and many places to eat. We loved the ice cream at Gem Theatre. Scenic Hwy 12, Bryce National Park, Cedar Breaks and Panguitch Lake. Little C's bakery is excellent. Are you affiliated with Hitch-N-Post Campground ?